This great commercial by Steve Wynn introduces his latest project "Encore", which is located next to the Wynn and appears to offer the spectacular elegance and amenities that have made the Wynn properties some of Las Vegas most spectacular venues. 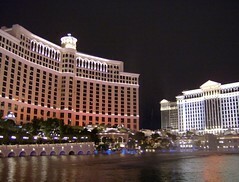 The Consumer Electronics Show "CES 2009" is coming to Las Vegas. Although some reports suggest attendance this year may be off from recent highs, CES Las Vegas remains the world's premier technology showcase. CES expects over 130,000 attendees and about 4000 press and bloggers to attend the event, which this year will include thousands of new technology products from computers to games to film to music, the CES Innovation Awards, SONY tapings of Jeopardy, Diana Ross in Concert at the Monster Cable retailer awards event, and much more. For more information about this event see the CES official website. Today in Las Vegas OJ Simpson was sentenced to what appears to be a minimum time in prison of 6.5 years and probably close to his full sentence of 15+ years in prison after a robbery and kidnapping incident at the Palace Station several months ago. 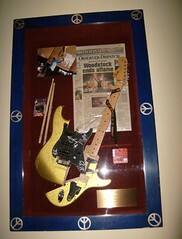 Tapes of the incident, where Simpson and associates met in a hotel room and effectively robbed a memorabilia dealer of Simpson items, appeared to sway the judge against the defense. The judge initially appeared to be defending herself from critics who might accuse her of a harsh verdict to redeem another court's earlier aquittal of Simpson after what most think was a clear case of murder. However she stated emphatically that she was sentencing on the basis of the evidence and facts of this case only. Given the extreme media scrutiny and Simpson's probaby guilt in the murders years ago, it seems very unlikely he'll be out of prison for many years and probably will remain in prison for the full term in this latest incident. Did justice prevail in this case? Just wanted to note some great deals are available through Allegiant Air for Las Vegas combination flight and hotel packages. 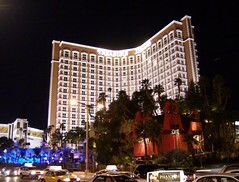 Last year for the Computer Electronics Show Conference "CES", I scored a huge savings by staying in Fitzgerald's downtown (which was not as glamorous as strip hotels but very clean and nice and saved me about $200 per day over what I would have paid for a room at Bellagio or Venetian). In Las Vegas you want to stay at the fancy places in the *off season* and middle of the week and stay in the modest priced places at high season. The savings with this strategy are *spectacular* because demand on Las Vegas hotels is extremely variable depending on the time of week and event schedules. 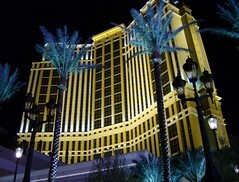 CES fills all hotels on the strip and the Hilton which is adjacent to the conference. The cost for say, the Hilton during CES will be about 400 per night for a room that'll run you maybe $75 mid week with no special events. The Allegiant Air specials vary enormously in price because of the hotel costs, so consider the excellent low priced hotels downtown or just off the strip and your trip will cost about a third of what you'll pay for premium lodging. Exception - if you can travel mid week consider splurging. 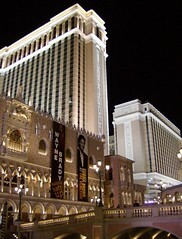 Places like the new Palazzo at the Venetian have premium suites that are often at great discounts mid week. AARP has a one page article about Las Vegas on a budget called "Viva Las Value" and written by the good folks at VisitLasVegas.com. Some of the recommendations listed there are to take the airport shuttle to your hotel, which at $6 beats a taxi or limo. They also recommend the $5 day pass on the Deuce, a bus that runs up and down the Las Vegas Strip all day and night. This is good advice because no matter how much you plan expect to walk a LOT in Las Vegas. The buildings are huge on a scale pretty much unknown outside of Las Vegas and simply walking from one end of the MGM to the other will take you 5-15 minutes even if you don't get lost. Getting lost in the Casinos is easy as the signage is designed to some extent to take you around via the slots and other distractions. If you want good directions it is best to ask an employee rather than look for signs. Food advice from the article include all you can eat Breakfast at the Mirage's "Cravings" with some delicious selections including crab cakes and eggs benedict. They also note Main Street Station downtown as a good cheap buffet. They also recommend the Fremont Street Experience (ride the Deuce to get to the downtown Las Vegas which is about 3 miles from the strip). 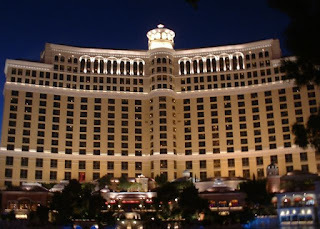 I would add that the downtown area offers great hotel bargains and fun "old style vegas" strolling experiences, though you should not expect to find anything like the glamour of the splendid lobbies and hallways of the Bellagio, Venetian, Wynn, or most of the jaw droppingly extravagant Las Vegas strip hotels. The Star Trek Experience at the Las Vegas Hilton ... ends today. After a ten year run and some three million visitors, the attraction at the Las Vegas Hilton is closing. Rather than a lack of popularity, it appears the closure is the result of contractual term challenges between the Las Vegas Hilton and Cedar Point which owned the show. The Star Trek Experience offered interactive rides simulating space travel and adventure, the themed restaurant Quark's, and more. 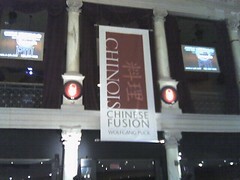 The Hilton has not announced what will replace this attraction, one of the most notable themed attractions in Las Vegas. The Las Vegas Hilton is a major off strip hotel that is adjacent to the Las Vegas Convention Center (though don't think you are right next door in the usual sense because walking from the Hilton rooms to the Convention Center via the skyway or below via sidewalks is a walk of about 10 minutes even at a fairly brisk pace. The Las Vegas Convention Center is one of the world's largest facilities and even getting from one end to the other is quite a hike. 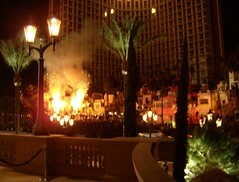 conclude its historic 11 year run at the Las Vegas Hilton on September 1, 2008.
stomping grounds for fans around the galaxy. Galaxy, and we carry those memories into our futures with us. Live long, and prosper. A digital media kit is available upon request. The Computer Electronics Show is one of Las Vegas' biggest conferences and is the most influential electronics show in the world. 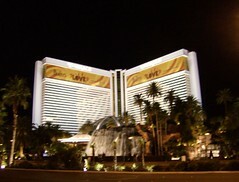 Spanning two huge venues - the Las Vegas Convention Center and the Sands Convention Center at the Venetian Hotel Complex, CES 2009 will be held in January. A new fee structure is making it even easier to get into the exhibitions at this amazing event, though you will find the strip hotels at very high rates for most of the week AND mostly sold out. Consider staying downtown for a cost break. Fremont Street hotels are not as extravagant as the big places on the strip but most offer comfortable, quality rooms in the 50-100 range. Expect to pay 3-5 times that amount on the strip during CES. 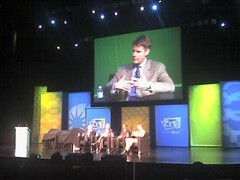 CES 2008 Intl Panel. Meyer on leveraging existing cell infrastructure for health. Las Vegas Construction loans are among the largest in the industry, and have put a strain on some banks with high exposure. Although the commercial real estate industry seems surprisingly healthy given the current residential meltdown, some banks are still suffering under the pressure. 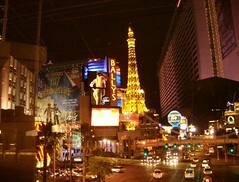 Click here for a street view of Las Vegas Boulevard. For most, the Las Vegas Strip will be most of what they see during their visit to Las Vegas. The Downtown "Fremont Street" area is of more historical interest and has a lot of smaller casinos and the spectacular Fremont Street Experience - a huge light canopy that is several blocks long and towers over you. However it's the Las Vegas Strip where you find the mega-resorts that make Las Vegas one of the world's top tourism destinations. 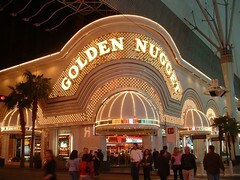 Click here and drive the strip to get familiar with the area before you go! 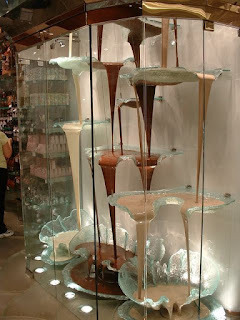 Bellagio Las Vegas' Chocolate Fountain - the world's largest Chocolate Fountain. 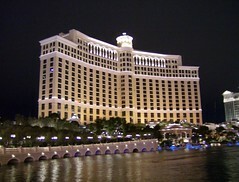 Don't miss the Bellagio's fine free attractions - some of the most elegant in the world. In addition to the Bellagio Fountains in the front of the hotel where you'll be amazed by the water and music show, inside near the main huge lobby area you'll find the world's largest *chocolate* fountains, where hundreds of gallons of liquid chocolate flow gracefully within a sculpture that is some two stories high. Be sure to take enough time here to realize the size of this choco-masterpiece, and see if you can resist buying a treat at the chocolate gift store. 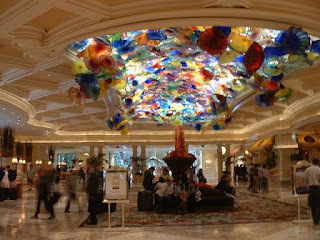 The Bellagio is also home to several other amazing attractions including some of the world's most extravagant hand made colored glass sculptures in the lobby, fantastic natural landscaping creations in the Bellagio nursury area, and a superb art museum (this costs about $15 but is worth it, especially if you have never visited a great art museum). Bellagio owner Steve Wynn has one of the world's great art collections and many of his pieces are on display here at the Bellagio. Las Vegas, as one of the world's top travel destinations, has more websites devoted to it than you can shake a pair of dice at. I'm still not clear why "Vegas.com" claims to be the 'official' site when VisitLasVegas.com appears to be "the" official site of the tourism bureau, but when booking you'll want to check rates at several sites and generally you'll be better off starting with Kayak.com for comparison shopping on prices. Then contact the hotels and other consolidators to see if you can land any special deals. 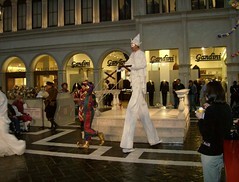 Las Vegas offers visitors to the city one of the premier shopping venues in the world. 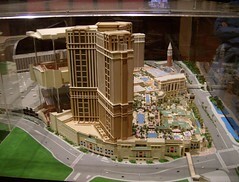 Unfortunately for bargain hunters you won't necessarily find good prices in the beautiful and extravagant casino shops. 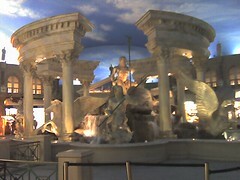 However you will find some of the best window shopping in the world at places like Caesar's Forum Shops, Venetian Grand Canal Shops, and the huge Fashion Show Mall across from the Wynn Las Vegas. The Las Vegas Strip is almost always called "The Strip" in Las Vegas and refers to the stretch of Las Vegas Boulevard that is about 4 miles long. Mandalay Bay is the large resort at the south end of the strip, and the Stratosphere is at the North end. Note that the monorail route is from the MGM to the Sahara and you'll need to walk a fair distance to get to these two venues. Also note that the monorail does NOT follow the strip even though it serves strip destinations. The monorail rides from Hilton and Convention Center which are on Paradise, and then "behind" most of the Casinos. 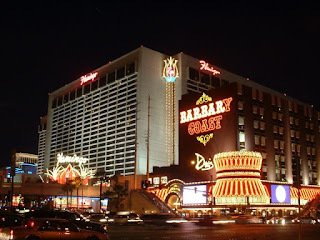 Always expect to walk a long way in Las Vegas unless you stay at the same casino, take Taxis, or spend your time downtown in the Fremont Street Experience area were the size of the casinos is much smaller and you can easily walk to several in a short time. Thinking of retiring in Las Vegas? With an excellent climate, low taxes, good community services, an excellent university, and reasonable home prices Las Vegas is home to many retirees. 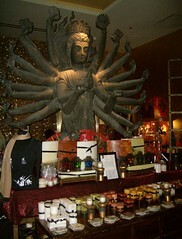 Before retiring to any city you'll want to consider an extended vacation in the area. Communities take some time to understand and often the tourist view is not the same as a resident's view of the community. Looking south along Las Vegas Boulevard "The Strip" from a footbridge. This reflection in the right is - I think - from Harrahs which is actually to the left. 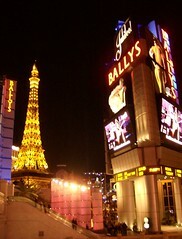 Signs for Ballys and the huge Eiffel Tower (half the size of the real one) and illuminated balloon at Paris Las Vegas tower above the street in the background. 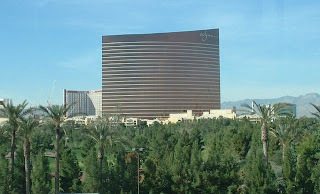 Although there is no "official" center of Las Vegas, the area along the Strip between the Wynn and the Bellagio a good candidate. Here you find many of the major resort casinos and an almost unending stream of foot and car traffic. Always bring *comfortable shoes* to Las Vegas. Even if you are prepared to travel by Taxi, the Deuce Bus, and the metro whenever possible you will be walking a lot as the Casinos tend to route foot traffic to maximize their profit rather than your walking distance. If you are lost in a casino *ask* a staffer for directions - they'll generally give you the most accurate and fast route. The Las Vegas Airport is one of the most manageable in my experience. 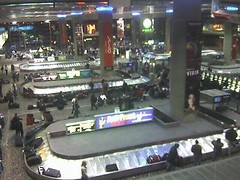 Large but not huge, McCarran is fairly easy to navigate, especially if your arrival and departures are using the standard Taxis or Shuttles. City bus service in and out of McCarran is a little trickier as the bus departures are from level 0 and not signed well. 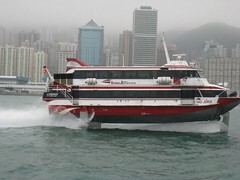 Unless you are really short on cash the best option will generally be a Taxi if you have more than 2 people or the comfortable $5 shuttles which leave from just outside of the baggage claim area and deliver you to the door of your hotel for $5. Although the Las Vegas Strip, home to dozens of mega resorts and casinos, now plays the key role for most visitors to the city you'll want to consider riding the Deuce bus or taking a short Taxi ride to Downtown Las Vegas, renamed "The Fremont Street Experience". Here, the world's largest light show is displayed on a screen as wide as a street and as long as a city block. Short shows play frequently from about dark to midnight. Las Vegas has a great selection of transportation options that vary quite a bit in terms of cost. Many folks take taxis around, but it's not clear to me that they save any time over the cheaper alternatives since during big events you may have to wait in a taxi line at the hotel. The Monorail is fantastic, and it is what you want to take if you are near a monorail station - basically places between the Sahara on North Las Vegas Strip and MGM to the South. This is *the way* to get up and down the strip unless you *really* love to walk. The strip his huge so wear great shoes in any case, even if you'll be taking transportation you'll be walking a lot. The $5 shuttles from the Airport are comfortable but usually pretty slow as they stop at many hotels.